Read the ebook “Implementing Cloud Storage with OpenStack Swift” to gain knowledge to implement the most advanced of Openstack Swift’s features. This book has been co-authored by Kris Rajana, Amar Kapadia, and Sreedhar Varma who have immense years of hands-on experience in storage technology. 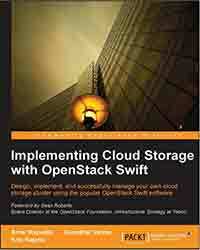 The authors have explained complex concepts related to cloud storage and OpenStack Swift in a very simple and lucid manner. The book contains 8 detailed chapters that will help you learn about the fundamentals of cloud storage using OpenStack Swift. While the book delves deep into OpenStack Swift Architecture, it also provides some interesting design examples and use cases for Enterprises looking to implement OpenStack Swift.